Still feeling Christmassy ? The new Weekday Escape is here with more holiday games! You find yourself in Riddle Escape's room, pleasant music plays and everywhere around you are locked cupboards, tables with coded drawers and closed boxes. Only Christmas tree is missing...no, it isn't, you can see it outside, huge and beautifully decorated, but the door is locked. Well, time to start with escaping! White Christmas turn into Green then, no1game wants you to catch ten green escape-men. They don't want to be captured and do they best to hide or run away. No wonder, they are escape-men after all. But you are bigger and smarter and catch them all®! The last Amajeto's game is traditional, peaceful and relaxing. Can you escape? I know you played White Christmas last week (WE -N°165). This is not a mistake, just coincidence, Riddle Escape delivers new Christmas game of the same name. You start in very Yomino Kagura like brick room and the only difference between their older games and this one are Christmas symbols everywhere, probably all of them and even those you don't even know. Opening exit door is not the end of the game as it's bigger than it seems and also more beautiful and atmospheric. You get more puzzles to solve than you expect! Ten Escape-Men you must find to get out of no1game's room! And be prepared for a proper hunt! These little guys are cunning, some well hidden at suprising places, some are trying to trick you, some to run away (and they are fast!) and some leaving red herrings behind. Remember to take a close look at items in your inventory - they are able to get even there! Can you find all of them and get out? At the beginning, don't forget to switch language to English unless you can read Japanese. The intro is skippable. 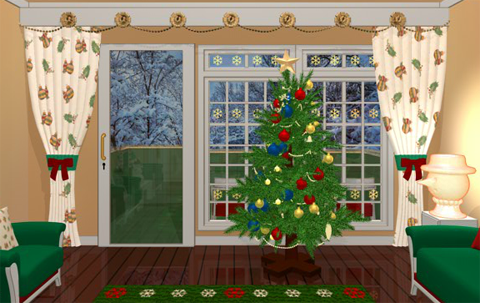 Amajeto's room decorated in red and green is a nice place to visit. Soft light, things are on their places, pieces of jigsaw scattered around the room and you know exactly where to put them after you get all. Puzzles are clever and well balanced, not too easy, not too difficult - solid escape game you get - and there is never enough of them, right? In case you want more, there are some awsome games from JiG archives: Robamimi's games Snow Dance and Snow Dance 2, Bart Bonte's Christmas Cat or, if you have enough escape games, his A Blocky Christmas. Also, Grow Maze by Eyezmaze - nothing to do with Christmas, but it's so gorgeously uplifting and heartwarming like this season is - or should be. It's instant happiness pill! For more try tag Christmas or Xmas or Holiday or Seasonal. Riddle Escape has prepared a very different yet rather familiar Christmas experience. If you're still in the Christmas spirit, this is definitely a game for you. You start off facing a window overlooking a snowy courtyard. The window has snowflake patterns on it, except for one of its panes. So step back into a red-bricked room, facing a locked door whose handle has two different-sized bells hanging from it and a string that suggests that one bell is missing. The window on the left is similar to the one you just saw, but the view and patterns are different. Turn right to find a table with four slices of cake on plates but only one different fork, and a safe with eight buttons that light up with candy cane symbols. The drawer of the table is missing a handle, and the cupboard above it is held shut by a wooden board screwed to both doors. On the right side of the room, a picture showing four lit candles of different heights is screwed to the wall, over a round wooden box on a round glass table. The box is locked and has a tiny hole in its top. Turn right to find a tall cupboard whose top doors are locked and need a key, and whose bottom doors have handles tied together. To the right of it on the same wall, there's a shelf with three empty wineglasses on four plates marked with card suits, and another shelf with three unlit candles in four candle holders beside a candle clue. Turn right to find a low white cupboard with three pairs of doors you can't open. The left pair has a snowflake engraved into one of its doors, the middle pair is missing its door handles, and the right pair is locked with a four-button device whose buttons flash snowflake symbols when pressed. On the cupboard, a four-digit safe has digits in different colors, and a cubical white safe has four diamond buttons that don't work and a rectangular indentation to the right of those buttons. Above the cupboard, there are three different-colored picture frames with different Christmassy symbols on starry backgrounds. Further to the right on the wall, there's a set of display shelves. Some of its compartments have upright candy canes in them, and some have numbered wrapped present boxes with black stripes on their lids. Use the clue from the window decorations to unlock the right pair of doors on the white cupboard. The window panes with 1, 2, 3, 4, 5 snowflakes are on the UL LR UL UR LL corners of their respective (LRRRL) windows. So click the ⌜⌟ ⌜⌝ ⌞ buttons on the door lock to unlock it. Inside, there are starry party hats in four colors and a three-digit safe with a mathy present clue. Use the clue from the party hats in the white cupboard to unlock the four-digit safe. The green, red, yellow, blue hats have 3, 1, 6, 5 stars on them. So enter 3165 in the safe to open it and get two door handles. So use the handles on the middle pair of cupboard doors, and open them to find a wine glass in front of a numbered wrapped present, and a four-button box where the buttons, labeled with card suits, display white bars which rise upwards when clicked. Do some math with the presents to unlock the box in the right doors of the white cupboard. The presents with 1, 2, 3 stripes are numbered 80, 10, 46, so the formula on the box works out to 846. Enter that in the box to unlock it and get a box of matches. 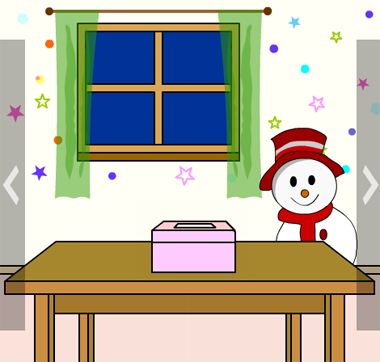 Use the clue from the candy canes to unlock the eight-button box on the table. The candy canes are in the third compartment from the top in the left column and the first and third compartments from the top in the right. Place the wineglass on the empty plate on the wall shelf, and pour the wine into all four glasses. The glasses are now equally full with purple fluid, but white stripes appear at different heights on each one. So use that clue to unlock the four-button safe in the middle white cupboard doors. The highest stripe occurs on the club plate, followed by heart, spade, diamond. So click the buttons 1, 2, 0, 3 times to match. The box opens and you find a candle inside. Place the candle on the empty candle holder, and light it with the matches in the order indicated by the clue. The shortest candle in the candle picture was the 4th from the left, followed by 3rd, 1st, 2nd. So light the candles in the same order, and a compartment opens up with a golden key inside. Use the key to unlock the top doors of the tall cupboard. Inside, there's six cups with handles facing different directions, a three-button safe with bowtie buttons that spin around, and another three-button safe where the symbol buttons are outlined in different colors. Use the clue from the framed pictures to unlock the three-button safe in the top of the tall cupboard. The red, yellow, blue frames show a tree, sleigh and reindeer. So click the buttons 2, 0, 1 times to open it and find a screwdriver. Use the screwdriver to remove the board holding shut the cupboard over the table. Opening it up, you find three wreaths with bows and a three-digit safe with digits labeled by zodiac signs. Use the clue from the wreaths to unlock the three-button safe with the bows. The bows are on the bottom, top-left and right sides of the wreaths. So click the buttons 4, 7, 2 times to open the safe and get the fork inside. Place the fork in the box with four diamond buttons on the low cupboard. Each button now shows an arrow that you can rotate by clicking it. The other fork rests on the table next to four slices of cake. So use that clue to unlock the safe. Rotating the scene so the fork is on the right, you find that the cakes, in clockwise order from the one nearest the fork, point in the →↙↗↓ directions. times, and the box opens so you can get a paper note with different-sized bells printed on. Use the screwdriver to unscrew the candle picture and remove it. Behind, there's a box with two interesting buttons on it. Use the clue from the cups in the tall cupboard to unlock the two-button box behind the candle picture. The cup handles are on the LRRRLR sides of the cups. So press those buttons to open the box and find a drawer handle. Place the drawer handle on the table drawer and open it to find a book with zodiac symbols and a note with a safe combination. Use the clue from the zodiac book to unlock the zodiac safe in the cupboard above. The Taurus ♉, Cancer ♋, Sagittarius ♐ signs appear on pages 2, 9, 4 of the book. So enter 294 in the safe to open it and get a hexagonal part with a black pointer. Place the hexagonal knob in the wooden box, and arrows appear on the left and right sides. So unlock this safe using the clue from the drawer note. To match the positions on the note, turn the knob right 2 times (until it points right), then left 3 times, then right 5 times. The box opens up so you can pick up a shiny bell inside. Place the bell on the door handle beside the two already there, and use the clue from the bell note to unlock it. Click the SLMSML bells, which are the RLCRCL bells. Then click on the doors, which swing open to the courtyard. Right across the yard, you see locked gates blocking your way to a Christmas tree. At the foot of those gates, you see feet, or rather footprints and an arrow sign in the snow. You can also examine the gates more closely to find a pattern of black stripes on the leftmost bars. Click the left side of the screen to turn left. The snow pile on the left side of the screen has been neatly shaped into a column chart with snowballs on each pillar. Next to it, there's a pile of logs that you just can't light on fire yet. Next to that, a stone locker has a six-button lock with a colored stocking clue. There's also a wooden table on the right with two locked boxes on it. One has three squarish indentations, and the other has two buttons that flash footprint marks. Go back and click the right side of the screen to turn right. There're three snow igloos of different sizes, and another set of shelves. Three of its compartments have colored stockings (also mysteriously upright), and two have them have safes: a four-digit safe and a bluish two-button safe where the buttons flash snowmen. Use the clue from the footprints in the snow to unlock the footprint box on the outside table. In the direction of the arrow, the footprints are LRRLRR feet. So press those buttons to open the box and get a square panel. Use the clue from the colored stockings to unlock the stone locker. The yellow, red, blue stockings are in the lower-right, left, upper-right compartments. buttons in that order to open the locker. 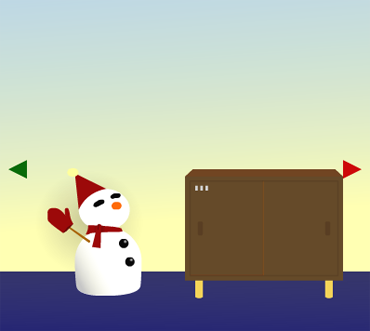 Use the clue from the snowmen in the locker to unlock the blue snowman box. From left to right, the snowmen arms point in the UDUDDU directions. So push those buttons, and the box opens up so you can get another square panel. Use the clue from the bars on the gate to unlock the three-button safe in the stone locker. The black stripes come in groups of 4, 1, 2. So click the buttons 3, 0, 1 times. The box opens so you can pick up a square panel. Place all three square panels in the left box on the table, and it opens up so you can get a box cutter. Go back inside, and use the cutter to untie the bottom doors of the tall cabinet. Inside, you find a shovel, another letter clue over a safe with three different-colored fire buttons, and another bluish safe with three tall buttons marked with stars that rise. None of this stuff is helpful right now, so head back outside… whoa, it's nighttime already! Use the shovel on the igloo entrances to open them up, revealing different-colored fires inside. So use that clue to unlock the three-fire safe in the cupboard inside. The red, blue, yellow fires are in the small, medium, large igloos. So click the buttons 0, 1, 2 times to find a photo with a clue. Following the photo, open the present numbered 80 on the shelf. Inside, there's a block of ice which looks really frosty. Use both letter clues to unlock the four-letter safe on the shelves outside. Enter SNOW in the safe, and it opens up so you can get the newspaper. by placing it on the logs and starting a fire. Use the ice block on the fire you started, and it melts to leave you with a snow crystal. Use the snow crystal on the left pair of doors of the low cupboard, and open it to find a safe with four buttons that show more circles as you click them, and also three miniature Christmas trees in different sizes. Use the clue from the miniature Christmas trees to unlock the three-star safe in the tall cupboard. Click the star buttons 1, 2, 0 times to match the heights of the trees. The safe opens so you can get a blank piece of paper. You don't have any matches left, so you just have to use the paper on the fire outside. It chars a snowflake pattern into the paper with a subtle clue in it. Use the clue from the snowballs outside to unlock the four-button box with circles. From tallest to shortest, the columns hold 8, 3, 5, 1 snowballs. So click the buttons 7, 2, 4, 0 times to open the box and find another clue on a paper note. This new note tells you to look above and between the reindeer and tree. So click above the top-right corner of the blue picture frame to find a brick that looks different. You push it, and the blue frame slides up to reveal a panel with six forked ᛉ buttons forming a snowflake pattern. Use your last remaining clue, from the snowflake note, to unlock the snowflake panel. The arms of the snowflake have different numbers of stripes across them. The panel opens up and you find an even more nicely wrapped present. You can't unwrap the present, but you can turn it around to find a key attached to the back. So use it to unlock the final gates, and pass through them for a sparkly Congratulation screen with the present in the corner. thanks for the walkthrough to White Christmas,KK. Can't wait for the others. Ah yes, I forgot about the first season's greetings of 2018. Happy new year and a merry Christmas! It may still be a white Christmas, but this game may have you seeing green all over the place. You wake up trapped in a room where Santa('s figure) has a tweaky nose. He stands under a wreath with two bells that do nothing. Beside him, the main door has three small slots in red, blue and yellow, and then there's a light switch that you don't need to press yet. Stare at the wreath for about 8 seconds until an Escape-Man (#1) briefly pops up. Click the green dot on the wall above the door, which turns out to be another Escape-Man (#2). Turn left to find a Christmas tree and a very large bear with a black button for a nose. The tree shakes a little as you click it, but not much happens. But if you click 10 times, an Escape-Man (#3) flies out and lands on the floor! Look to the right of the tree's pot to find a folded note with symbols on it. Turn left to find a snowman (with a button on his nose), a table with a four-button safe on it, and a window that looks out into the night sky where some of the stars twinkle noticeably. You can look under the table on the left and right sides, but the faint white outline under the left side can't actually be picked up. Instead, you'll notice a tiny green dot near the top-left of the screen. So click it to find an Escape-Man (#4) clinging to a table leg. Turn left to a screen with a reindeer and its red, shiny nose (button). On the left, a capsule hangs from the ceiling but you can't open it by clicking. Turn off the lights and have a look around the darkened room. Nothing changes except on the reindeer screen, where a string is now glowing in the dark. So pull that string, and a Merry Christmas scroll descends from the ceiling. Before you turn the lights back on, notice that the folded note now has a green arrow glowing on its back, and an extra clue on its front when you unfold it. Turn the lights on and examine it to find that you can flip its bottom over and there's an Escape-Man (#5) hiding behind. Follow the clue on the folded note to unlock something. In the direction of the glowing arrow, the symbols are Reindeer (2), Bear (3), Snowman (3), Santa (2x2). So click the reindeer's nose twice, the bear's thrice, the snowman's thrice and then Santa's four times. An Escape-Man (#6) falls out of his beard! Use the clue from the window to unlock the four-button safe. The topmost stars blink in order, indicating the code 41323142. Click the buttons on the safe in that order, and pick up the Escape-Man (#7) and wire cutter from it. There's no wires here, so just play with the wire cutter a bit. If you hold the cutters shut for long enough, a green circle grows from the pivot and then falls out. Click it to get another Escape-Man (#8)! There's a weird sound whenever you switch to the reindeer screen, but you don't see anything special. Or do you? That sound is the shuffling of something under the floor. So click it really quickly to stun it. Then use the wire cutter to break the carpet open and find an Escape-Man (#9). Then turn the lights off again to find another Escape-Man (#10) in the same spot. They combine in your inventory to form a green Santa Claus. Click his right (our left) shoe to find a blue key inside. Click his hat to find a yellow key beneath. (Turn the lights on, and) use all three colored keys on the door to unlock it, then click the doorknob to open the door and leave! And here's the Amajeto walkthrough. You know how these games work, but this one has a few surprises up its sleeve. You start off facing a Christmas tree in front of the balcony door (locked) and window. Among the ornaments (and flashing star), you spot a tiny puzzle piece tied securely to the tree. Turn left to two armchairs on either side of a table with four unlit candles, a wrapped present next to a knitted snowman, and a puzzle piece. Above that, there are two framed photos. The right one has tilty corners, and the left one turns black when you zoom in, but you can click it to view another clue with a grid colored in four colors and five colored circles in a row below that. On the left side, several ornaments of different sizes hang on hooks with different colors, and there's a puzzle piece on them. Turn left to a screen with the exit door, where the wreath on the door has a puzzle piece resting in it. This screen also has the usual TV-and-cupboards combo, but the overhead cupboards don't open. Zoom in on each of the drawers (I'm calling them that) on the left and right sides. The left one has rectangular hole, and the right ones are locked with a four-color lock, a two-button lock and a four-digit lock. Under the TV, you can examine the piles of presents to find a puzzle piece on the right blue present. Turn left to a sofa with a jumbled picture above. On the left of the couch, there's a side table that's locked an requires a sequence of four colors to open. On the right, the other side table has a grid of square buttons that can be lit and unlit. Rotate the (randomized) tiles on the picture so that their patterns join up. A compartment opens up so you can pick up a puzzle piece. Use the clue from the Christmas tree to unlock the top drawer to the right of the TV. The star on the tree flashes red, yellow, red, blue, red, green. So click the 121314 buttons on the drawer, then open it to find a puzzle piece. Use the clue from the hanging baubles to unlock the left side table. From smallest to largest, the baubles are yellow, blue, green, red. So click the buttons 4, 3, 1, 2 times, and open it to find a key and a puzzle piece. Use the key to unlock the balcony door. Outside, you find a puzzle piece next to a red present. Use clues from a framed picture and around the room to unlock the right side table. The colors divide the large grid shown on the left framed picture into four smaller grids which match the (colors and) patterns on the wrapped presents. positions. Enter that in the table, then open it and get a remote control and puzzle piece. Use the remote to turn on the TV, which displays a sledding video that passes several hooked posts to end at a snowman with a painted belly. Use a clue from the TV to unlock the two-button safe. The posts appear on the RLRLRR sides, so click those buttons to unlock the drawer. Inside, there's a puzzle piece and a lighter. Examine the lighter and turn it on, then use it to light all four candles, and red stripes appear on them. Use the clue from the lit candles to unlock the lowest drawer to the right of the TV. From shortest to tallest, the candles have 3, 4, 5, 7 red stripes. So enter that in the drawer to unlock it, then open it to get a puzzle piece. Use the other clues from the TV and non-tilty picture to unlock the tilty corner picture. The red, green, blue, yellow, red dots on the left framed picture match the spots on the ⌟⌝ ⌞⌜⌟ positions on the snowman. So click those corners to remove the tilty picture, and open the compartment inside to find a pair of scissors. Use the scissors to cut free the puzzle piece from the Christmas tree. Now that you have all twelve puzzle pieces, place them in the left drawer and solve the (randomized) jigsaw puzzle, and open it to get a golden key. So use this key to unlock the main door and escape!